Lies And Truth About Comfort Height Toilets - Toilet Found! You may be confused, frustrated, puzzled or even oblivious about toilet seat height. Whatever. For the fact you are here is quite telling that you need a REAL comfort height toilet. And you are still searching, and nothing you have read so far can satisfy your idea of a comfort height toilet. That’s the whole purpose of this article. The information here will provide clarity on what right seat height is all about. And you will take away with some suggestions that are more in line with what you are looking for in a comfort height toilet. And in particular, to help the elderly and the disabled who need a right sitting height toilet for convenience, comfort, and safety. But first, let’s clear the air about ADA compliant or comfort height toilets if this is your first attempt at buying a water closet. Generally, the term comfort height is used to describe a toilet with its bowl height, measured from the floor to the top of the toilet seat (not including the cover) to be anything between 17 to 19 inches high. These height range is the same as an ADA compliant toilet. Anything that’s lower than 17 inches, it’s a standard height toilet. Or higher than 19 inches, it will be a non-standard toilet with an Exception clause to 604.4 of the American Disability Act for toilet seats. And different manufacturers will have a different name for it. For example, American Standard calls it the right height toilet, TOTO’s adamant that it should be universal height and KOHLER calls it as it is, a comfort height toilet. Whatever the term is, the same height range of 17 to 19 inches applies. So let’s just use comfort height here for the purpose of this discussion. Is The Comfort Height A Toilet Feature? Or Just Marketing Hype? If a pair of size 10 shoes fit you comfortably, would you buy a size 8 or 9 instead? Obviously, you won’t. And you wouldn’t want to call the size 10 a shoe feature just because it fits you, right? Just like shoes, you should feel comfortable with the right toilet sitting height. You should be able to sit down and stand up without any struggle. It has everything to do with your physical height, plain and simple. If you find a standard 15-inch height toilet comfortable to use, does it matter if it’s not a comfort height water closet? That’s too simple an assumption. Your physical condition should be taken into consideration too. A disabled person, or an elderly who has the same height as you will not experience the same convenience and comfort using the same toilet. That’s when an ADA or comfort height toilet can make a difference. A standard size toilet will have a seat height of between 15 to less than 17 inches. So a comfort height toilet will rightfully provide an additional 3 to 4 inches in height. And the extra height should alleviate the inconvenience for those with some disability or injury to use the facility. The extra 3 inches sounds great. A simple enough solution for the elderly folks and people with a mobility issue. Right. But have you tried to buy a comfort height toilet with a seat height of 18 inches or 19 inches before? Your enthusiasm will soon evaporate into thin air when you find out the truth. There are 2 measurements that make up a comfort height. That is the bowl height and the toilet seat height. Toilet seats are usually about an inch high or slightly higher on those with the anti-slip bumper. But it is safe to assume they are always fixed at 1 inch high. So that leaves the bowl height which has to be at least 16 inches tall to make up for the minimum 17 inches to deem as comfort height. So if you need an 18-inch seat height, you can get a toilet bowl with a height of 17-inch. And an 18-inch bowl for a 19-inch seat height. Easy? Or so you thought. That’s where the ‘fun’ begins. The truth of the matter is, you can never find a toilet bowl that is exactly 17 inches tall or taller. Why? But if you prefer to use a regular toilet seat, you can construct a raised platform of any height you like. Or get one of this toilet base riser to add a few inches to your throne. Here are some things people do to add that few extra inches to raise the toilet seat height. Are you OK with your toilet looking like this? Are they safe? Why Can’t They Produce 17 And 18 Inches High Bowl? The reasons are multifaceted. In the commercial world, no businesses are going to mass produce any product that has no or low demand. If it doesn’t give a good return on investment, nothing is going to happen. And customizations are not the specialty of the megacorps. Besides, it is usually expensive to personalize any products to suit an individual. So that means the majority of toilet users will accept a toilet seat height of between 14 to 18 inches. Which is about the standard chair height according to individual physical height. It will drive the toilet manufacturers nuts to manufacture a range of different bowl height toilets. Afterall, toilets are not shoes. The manufacturing process for the toilet is rather tedious and slow. So to achieve economy of scale, a 15-inch bowl height toilet naturally became the most common height for a standard size toilet. Then came the idea of raising the height by an inch to make getting on and off the toilet seat a little easier. An inch won’t affect much in the manufacturing process and cost. And most users generally can accept that extra inch in height. But it’s a huge opportunity for the marketing department to hype-up and drive higher sales volume, all in the name of comfort. Hence, the comfort height toilet. But that’s a one-sided and biased observation. It wouldn’t be fair to accuse the toilet companies for not making the 17-inch and 18-inch bowl height toilets entirely. In most families, there are family members who don’t need a high bowl toilet. So it may not be practical to have a tall toilet in every bathroom. And the least you want is to interfere with their toilet habits. Though there’s always the toilet stool, their rights to use the facility in a normal way should also need to be respected. So the solution is a slightly higher bowl that can easily cater to users of varying physical height. An inch higher won’t cause much of an inconvenience. Especially for the young and agile, and they will grow taller eventually. But what about the seniors and those with knees or hip problems? The comfort height toilets don’t seem to help much with their difficulty in using the toilet. That’s when an additional 3 or 4 inches will make a real difference for the elderly and the disabled. No matter how snuggly it fits, it can never be as secure and stable as porcelain. The higher the seat extend, the more it becomes unstable. You wouldn’t want to trust a frail elderly or someone with injuries or hip problem to be able to use the toilet safely with an extra high seat extender. If you have to use one of these toilet seat risers, please inspect that they are well secured before letting an elderly folk use it. As time goes by, you can never be sure when the fastening parts are going to lose its grip. Since the sitting position is elevated, the urinating angle (of ladies) is raised as well. And that will invariably increase the chances of sprays landing on the inner walls of the high seat. That may lead to liquid waste leaking out of the front seat base and dripping down the exterior bowl surface. And if the user is not feeling well with contaminated food, you can expect to see feces splattered on the inner seat wall and seat base. Good luck with trying to keep the seat, the bowl, and floor clean, daily. Unless the toilet is for personal use, other users will be inconvenienced. Even with a riser seat that has a quick release feature, detaching and re-attaching back the seat can be pretty annoying. A picture paints a thousand words. Nuff said. What About The Toilet Base Riser Or Toilet Pedestal? But still, nothing compares to a proper toilet sitting directly on the floor in one whole porcelain piece. Since the flange is extended above the floor, like anything with a joint part, you add the likelihood of mechanical failure which will result in leaks and more hidden areas for dirt, mold, and bacteria. And it doesn’t look any better than with a toilet seat riser. So does that mean there are no ways of getting a proper 18″ or 19″ toilet seat height without the use of a seat height extender or the pedestal? To answer the question above, you have two options (Previously there’s only one). The most popular and expensive option will require you to have an open budget for a bathroom remodel. You can’t use a direct replacement with this option. That’s because it’s a wall hung toilet. You will need to re-adapt your drain pipes from the floor to the wall where the toilet bowl is mounted. With this option, you will have the flexibility to set the bowl height from 15 inches up to 19 inches high. So effectively, you willl have a good range of sitting height from 16-inch right up to 20-inch. This is the best option compare to the next one. And the damage can easily be anything from $1,600 to $2,000 or even more. If you don’t have the budget for a wall hung toilet, then this two-piece floor-mounted Convenient Height toilet will be your best bet. And you don’t need to rob the bank to install it. It is a direct replacement of your existing standard height floor standing toilet. 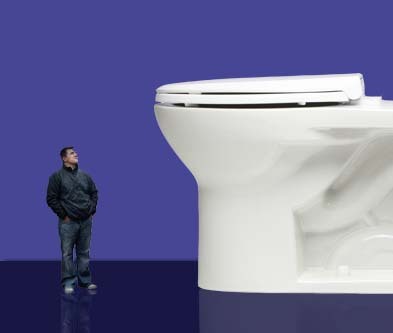 The Convenient Height toilet is a tall 20-inch bowl height toilet. And no, you are not drunk. It’s bowl height really is 20 inches high. So you will have a seat height of 21 inches with a regular toilet seat or washlet. However, the disadvantage is the fixed 20 inches bowl height. So if you only need 18 inches or 19 inches to find comfort with the seat, this may not be suitable for you. But the cost compare to the wall hung toilet is a lot more wallet friendly. But why the need for a 20-inch tall toilet bowl? The Convenient Height Toilet is the brain child of Eddie, who has worked in the independent and assisted living buildings for over 10 years. He has the knowledge and experience working with the elderly and those with a mobility problem. So he is definitely the go-to guy if you are looking to help your aged parents, or perhaps yourself, with a real comfort height toilet. It will be a good idea to tap on his experience. So go ask him why he has chosen the 20-inch bowl height instead of the ADA stipulated 19-inch maximum. You can find more details about the Convenient Height Toilet here. Looking for the right height toilet may not be as easy as it seems. However, with an aging population that’s plaguing the world, the days of the take-it-or-leave-it 17-inch comfort height toilets may be numbered. Toilet makers will pick up the trend eventually. And we should see more elderly or disabled friendly toilets rolling out of production floors in the near future. Or perhaps it is already happening now as seen with the emergence of the Convenient Height Toilet. And don’t be surprised to see an 18-inch or 19-inch seat height toilet coming from the same home-grown American company who makes it. Rants over. Add to Flipboard Magazine. I am 5′-10″ and “comfort height” toilets are way too tall, leaving my tip toes touching the floor and the rest of my foot off the floor because…the toilet is too tall. I hate “right height” or “comfort height” or whatever they want to call toilets that are too high for us NORMAL height folks. Buy the real toilet that is 18″ to 21″ high. Those raised cushions are gross and the raised height is gross and difficult to clean afterwards – what a mess! and removing and adding the extenders is disgusting. Just buy the Kohler 18″ as is better than nothing but if handicapped then go higher but just replace the whole toilet and be done with it. I am in the same opinion as Sanda Rina with regard to the natural position for defeating, but understand the need for others who need a taller seat height My wife and I moved in with my mid 80yo in laws early 2018. Within a month I started having difficulty voiding my bowels, cramps and irritable bowel syndrome. I had had the experience many years ago to work in India where “toilet” was a large tile with footprints, you squat over the hole and did your business, made me think. I brought a plastic step stool into the bathroom and plant my feet on it, problem solved. I have learned that there is a product called a squatty potty made for this. I know that this is a little off topic but it is the other side of the coin for mixed households of young and old. Hi Gregory thanks for sharing. I am 5’8″ tall and 65 years old. I hate the new “comfort” seats (why are they comfortable?) and love my old standard height. The standard height has been comfortable for most people for decades.The human body was designed to squat when defecating. Sitting high up is an unnatural position, perhaps that’s why so many Americans suffer from chronic constipation. Plain and simple; the new “comfort seat” toilets were designed to be ADA compliant for people with disabilities and companies want to sell more of them. First they were called ADA compliant and now they are called “comfort” seats. Unless you have a disability or injury that makes it difficult to get up and down from a standard seat, why buy a high “comfort seat” and maybe have to use one of those clunky stools underneath? Most public toilets are the new higher height and my family (all tall) find them so uncomfortable. Interestingly, for decades and decades we have had standard height seats and the same amount of tall people, but now all of a sudden people think they need an ADA compliant taller seat to be comfortable. I suggest anyone try using a “comfort” tall seat a few times before they purchase one. I’m replacing two older standard height toilets with new low flow standard height toilets, which sadly, now are available in limited options. Couldn’t agree more with you Sandirena. It’s getting harder to find a standard height seat these days with the features you prefer. Susan. Can you send me a message via https://toiletfound.com/contact/. Let’s see how can I help. 27 inches would be wonderful. The problem is I either want a new taller base for the top I have (Gerber 21-362 with Sloan Ultra-flush 1.6 gpf) that isn’t super long (preferably round) or an entirely new toilet that has the same specifications. I wish Gerber Support would reply… but with the holidays, I’m sure they are backlogged. Well I’m sure they will reply. Round bowl is rare with tall toilets but if 27″ depth is OK with you then perhaps the 20 inch bowl height Convenient Height toilet may just be what you are looking for despite it’s an elongated bowl. And you won’t need any height extension, plastic or otherwise. So I made the big decision to replace my working toilet with the ultra-flush system to the raised height. No problem, right? Wrong. I have a long narrow bathroom with very little space between the toilet and the tub. The new taller toilets that have the ultra-flush sytem only come with the elongated seats that are supposed to be more comfortable. Yes, I’m rolling my eyes. I have that shape now and really want to go to the smaller round bowl. Guess what? It’s not available in any company I’ve researched so far. Not only that, the new elongated bowls are approximately 1-1/2 inches longer in depth – so I will lose even more space in my bathroom. So I saw an advertisement for a spacer that goes on the floor that the toilet sets on. I’m thinking… ugh — a nice ledge all the way around the toilet for dog hair and bad aim to settle. Since I cannot get a raised bowl in round, this would be my only option though. Still not good – it only comes in plastic. Hi Susan. Sorry to hear that. But what’s your limit on the toilet depth? Is 27 inches (from the wall to the front tip of toilet) right for you? Have you look into the Convenient Height toilet?